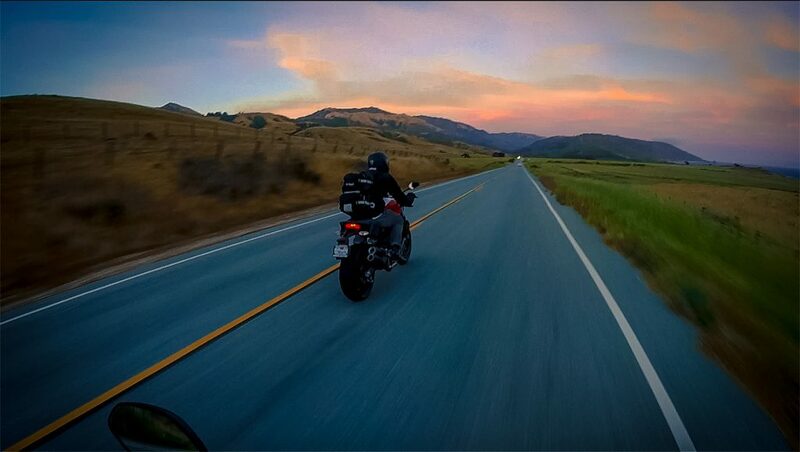 Nice GoPro capture of me obeying the speed limit somewhere near Big Sur. There are certain things a man desires above all else. The loving affection of another. The respect of his peers. A life of perfect health. Abundant and lasting wealth. Oh, and one more thing. To hear the sweet siren song of a Ducati twin-cylinder Testastretta motor resonating through dual carbon fiber pipes as you blast along the winding coastal cliffs of Highway 1. I can’t remember the exact date I added riding Highway 1 to my bucket-o-adventures, but I can tell you, after many years of dreaming, the catalyst for action came down to one simple concept: FOMO. My friend Matt knew riding a motorcycle down Highway 1 had been collecting dust on my goal list for several years. So he did what any good friend would do—he tried to book the trip without me. A few minutes of “can we actually do this” anxiety later, and the PTO was scheduled, the plane tickets were purchased, and I was on the EagleRider website putting down an $800 deposit on a Ducati Monster 821. Five weeks of agony followed as we counted the minutes until we could trade our corporate gingham and laptop bags for armored jackets and waterproof backpacks. We passed the time by filling in the logistical blanks. We’d pack next to nothing, carry our helmets onto the plane, stay with friends and in Airbnbs along the way, and capture the entire thing with helmet-mounted GoPros.